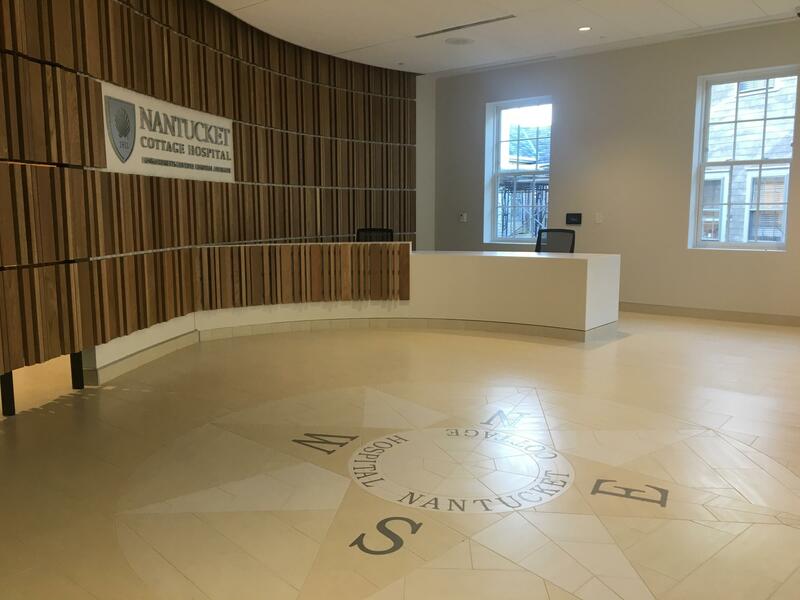 The lobby of the new Nantucket Cottage Hospital. The Nantucket Cottage Hospital will begin transferring patients to its new building on Wednesday. It’s the island’s only hospital, and the new building replaces one that’s been in service for over half a century. The Cottage Hospital, named as such because it was started in a small building in 1911, is finally getting a long-awaited re-do. Though the new hospital is located next door to its former building and covered in the same Nantucket-grey shingles, its interior will be sleek and modern. "Our wonderful 1957 building, which was built before medicare, before cell phones, before cardiac catheterization, had really outlived its usefulness," Margot Hartmann, president of the Cottage Hospital said. "That's when we knew the time had come to think about a new home for Nantucket Cottage Hospital." The new hospital building has been about eight years in the making and cost nearly 90 million dollars, all of it funded by the community. The former building was built in 1957, back when Nantucket’s population was much smaller. In its updated form, the hospital will be able to offer more comprehensive operating services, and it’s also built to withstand a Category 5 hurricane. "We currently have one small, undersized OR in which we do C-sections, general surgeries, colonoscopies, anything—all procedures," Hartmann said. This has led to some difficulties in scheduling surgeries. "Right now, we don’t start a complicated surgery case if we have a mother laboring, in case it needs to be converted to a C-section suddenly," she said. The old hospital also has smaller rooms and lower ceilings, and it doesn't offer much in the way of patient privacy. Jason Graziadei, communications director for the hospital, described the current situation as he stood in the lobby of the old building. "This is the area that’s a public hallway, but also, just because of the positions of the clinical departments, you might see your friend or neighbor walking down the hallway in their johnny, or on a stretcher," he explained. "That doesn't provide the privacy that we should be providing." Hartmann said the winter is a pretty quiet time of year for the hospital—on this day there are just two inpatients—but the hospital needs to be prepared to handle the summer surge, when the population can quadruple. "What Nantucket brings is remoteness and sophistication and preservation, and you don’t get those three things in many places," she said. She added that Nantucketers need access to quality healthcare in order for the island to retain its appeal. "You need a community, and if you’re going to have a community you need a hospital. Not an urgent care and a helipad." Once its doors open, the hospital will demolish its old building to make room for a second phase of construction: building temporary housing for its staff. The commercial bay scallop season opened on Nantucket at the beginning of November and will run through the end of March, but for bay scallopers, this year’s harvest is already looking to be pretty lean. Out in Madaket harbor on the western-most edge of Nantucket, scalloper Blair Perkins is throwing out a test dredge, and scanning his catch for the iconic bivalve that seems to be getting scarcer and scarcer in a net full of shells, crabs and spanish moss. Nantucket is gearing up for the summer season, when it becomes a prime vacation destination. But for a portion of the island’s year-round population, it's when finding housing becomes a squeeze. A catastrophic sewer break on Nantucket has released more than one million gallons of sewage and stormwater into Nantucket Harbor. Roberto Santamaria, the island’s Health Director, said the winter weather is likely to blame for the rupture.